Our goal is to help facilitate our authors for the seamless and professional publishing of eBooks with Bentham Science Publishers (BSP). These instructions will guide authors on all steps for the preparation of their eBook/chapters. The preparation and publication of an eBook is a joint effort between author(s) and publisher. We encourage authors to concentrate on the scientific content of their eBook and leave the minor layout and compiling matters to us. Easy submission process – Direct submission of the eBook/chapters to our editorial office via email at ebooks@benthamscience.net to be then dealt by a dedicated editorial manager. Your editorial manager will guide you through the eBooks planning, submission and publication. eBook Peer Review – Thorough and rigorous peer review process conducted by a neutral panel of experts to ensure originality of the contents. Complementary eBook Access for all contributors – Entitlement to the author/editors/contributors to free access of the published eBook. Publication in multiple formats – Publication in various electronic formats such as PDF, HTML and ePub formats, in addition to print-on-demand editions. Distribution on various eBook platforms – Distribution of eBooks through multiple eBook aggregators and library platforms - including Barnes & Noble, eBooks Corporation, eBrary, Amazon, etc - for extended buyer access. Open Access eBook/Limited Open Access: offers an author fee based publication option that allows free open access and downloadable content with potential to reach a larger audience of readers. Bentham eBooks is a comprehensive online eBook/eBook series publication program intended to cover all major disciplines including sciences medicine, technology, humanities and social sciences. Bentham eBooks publish authored and edited eBooks, textbooks, monographs, handbooks, review volumes, eBook series, etc. The below author guidelines are based on standardized eBook writing norms, and have been fully endorsed by the publisher. Author(s) and editor(s) of Bentham Science eBook(s) should endeavor to follow these guidelines before submitting chapter(s), eBook or eBook series material to the publisher. Authored eBook is written by the single author. Edited eBook is written by multiple authors and edited by one or more editors. eBook Series is a set of eBooks published in a series of volumes either in a closed (finite number of volumes) or open series format (indefinite number of volumes). Interested Author(s)/Editor(s) may submit the proposal for eBook series using the Proposal Submission Form for any of the following types of eBook series. The publishing contract signed by Author(s)/Editor(s) for the publication of series will initially be valid for two volumes and may be renewed by mutual consent for future volume(s). Authored Series: Each volume is written by one, two or a maximum of three authors. The book series volume may comprise of several chapters written by the same authors. Edited Series: Each volume is edited by a minimum of one or a maximum of four editors. The book series volume may comprise of several chapters written by different authors, solicited by the Editor(s). Simultaneously, the editor(s) may also be the author(s) of some chapter(s). Editor(s)/Author(s) interested in Editing/Authoring a complete series or even a single volume, on any one of the titles mentioned here, may contact at ebook-series@benthamscience.net. Author(s) interested in contribution of one or more chapters, to any one of our ongoing series mentioned here, may contact at ebook-series@benthamscience.net. 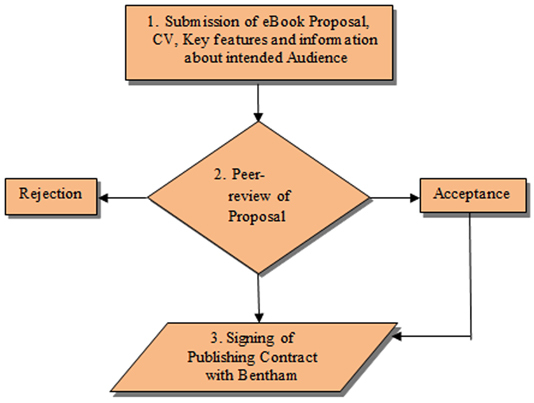 Once the peer-reviewed eBook proposal is approved by BSP, the Editor/Author agree to sign a publishing contract for their eBook with the publisher. For all online submissions, the complete eBook/chapter(s) must be provided in the form of a single zipped folder containing soft copies of all the materials (main text in MS word or Tex/Latex format, figures/illustrations, tables, equations and chemical structures) as separate files, while a PDF version of the entire eBook/chapter must also be included, embedded with all the figures/illustrations/tables/chemical structures etc. in the correct location. The eBook must be written in English (American or U.K. spelling), in a clear, direct and active style. All pages must be numbered sequentially, facilitating in the reviewing and editing of the eBook/chapter. Authors from non-English speaking countries should collaborate with English speaking colleagues or contract with professional English editing companies who can check and improve the language, style and grammar of the eBook. Alternatively, for English language and grammatical corrections, editors/authors may also seek assistance from Eureka Science, our contracted publishing services company.